Information has been provided on these pages in hope that it will be useful. Each of these pages contains steps followed to complete certain modifications on my bike. This is not a shop manual. I am not a mechanic. I assume no liability for any damages, direct or otherwise, resulting from the use of this information. If you choose to follow the steps on these pages, you do so AT YOUR OWN RISK. Kudos to Cruisin' Dave (Dave Sproul) for coming up with such a wonderful mod. 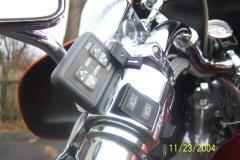 Many motorcycle riders around the world are now benefiting from this setup. I believe that this is presently the neatest most useful mod on my Valkyrie Tourer. Thanks Dave!!!! This mod was made possible with the help of many guys on the VRCC Tech Board (in this case, especially Joe Byrd who has walked me through each step of his installation and also Þrúðr who filled in the gaps when I hollered for help/info). The following has also been inspired by the excellent write ups listed in the Links section at the bottom of this page. Other than adapting this setup to my Valkyrie Tourer, I didn't invent anything. All ideas, modifications, etc. were taken (borrowed, copied, etc.) from different sources as explained above and throughout this write-up. If I have borrowed something from your web site and have forgotten to mention it, please let me know and I will correct the situation immediately. I can easily be contacted through the VRCC Tech Board. My handle is QueXpress. view the full size picture. - assorted clamps, attachments, connectors, etc. Part number 730-1347 at NAPA. 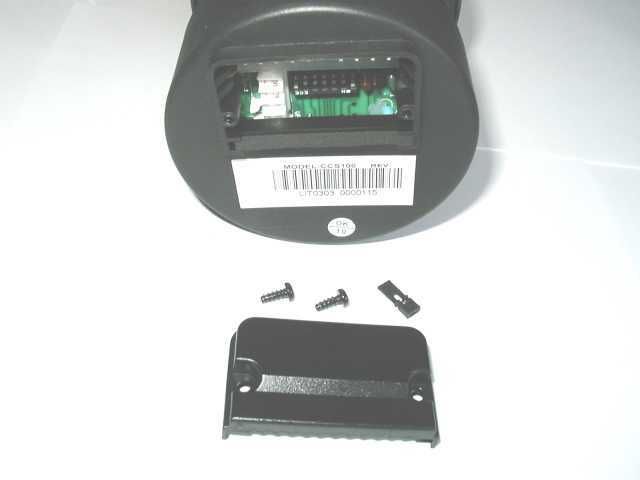 At AutoZone, Pep Boys, etc., look in the Help section for part number 47149. It will be in a little red package named HELP. Make sure that the vacuum side is pointed towards the carburetor. To check this, you can blow through one end of the valve. 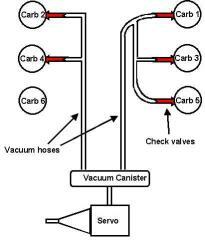 If the air flows freely, you are blowing in the supply side (should be pointed towards the canister). 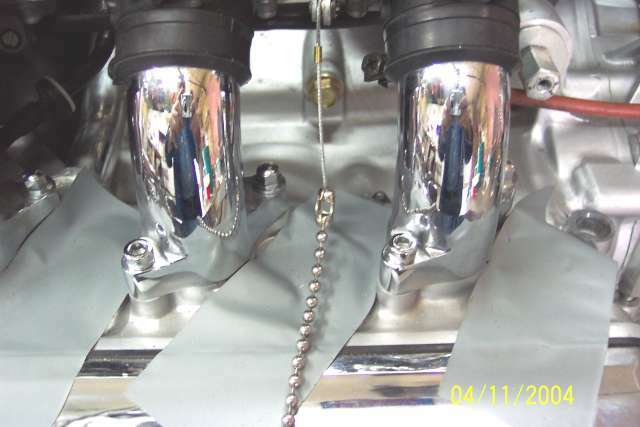 If the flow is blocked, you are blowing in the vacuum side (should be pointed towards the carburetors). 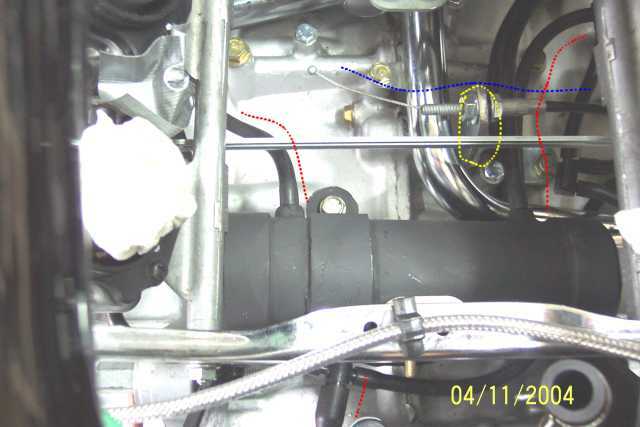 The black end of this check valve is the vacuum side (point it towards the carbs), and the white is the supply side (point it towards the vacuum canister). Since the diameter of the white end is smaller than the black end, a small piece of gray duct tape was wrapped around it (one layer). 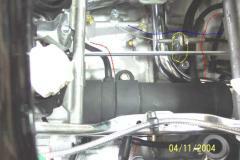 The check valve now fits tightly into a 5/32 vacuum hose. Tip from John Schmidt: Electronic shrink wrap (with glue inside) could have been used instead of duct tape. 3 brass hose barb to NIP adapters (3/16 X 1/8) were picked up at a hardware store. 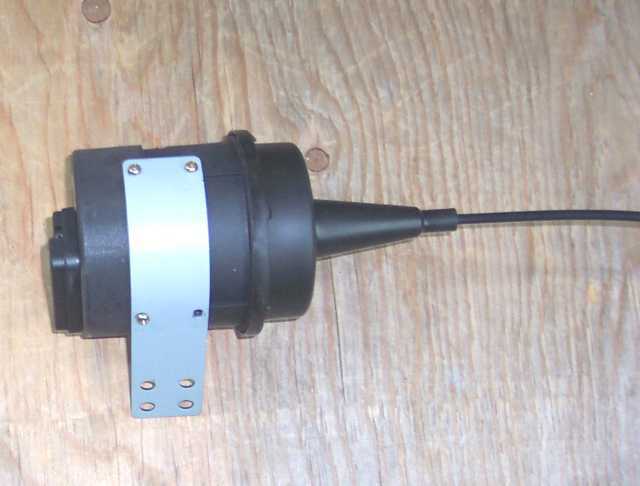 The CCS-100 requires constant vacuum to supply mechanical power for the throttle actuator. 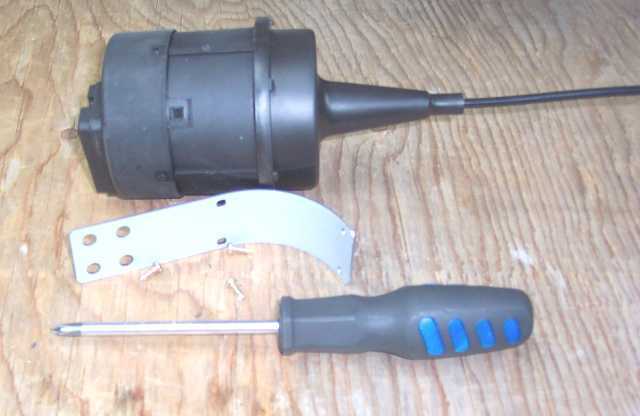 A vacuum canister has been fabricated to satisfy this need. The canister is a 6 inch X 2 inch PVC pipe with caps at each end. 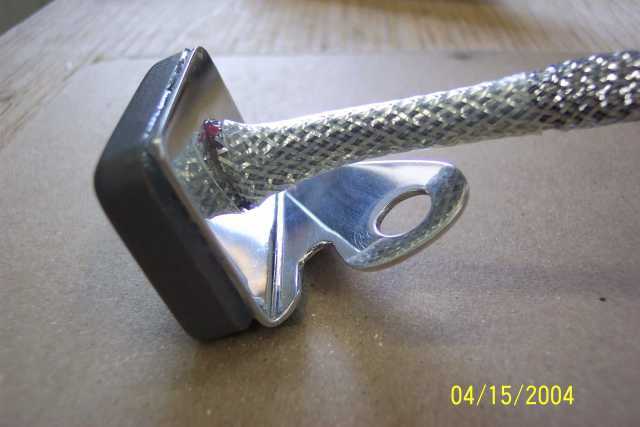 A piece of aluminum was wrapped around it in order to make a bracket (to fasten it to the top of the engine). 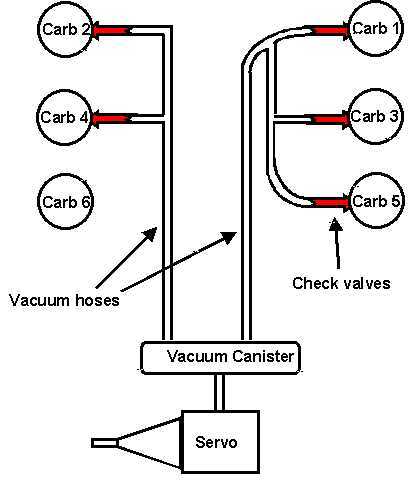 The canister is connected to 5 vacuum ports (with a check valve on each port). 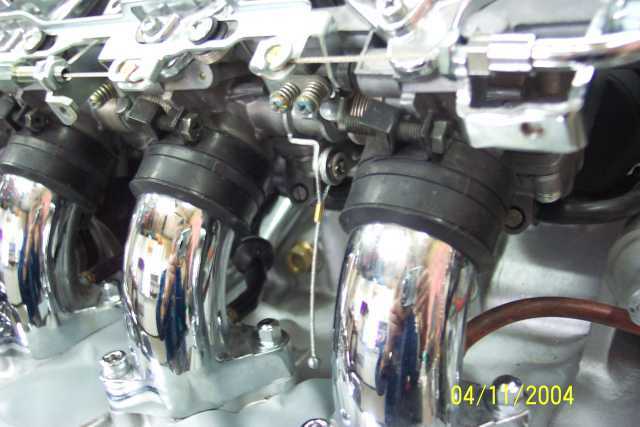 You can see the 5 check valves, and how the tubes are set up. 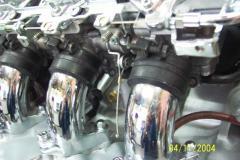 The 3 at the top of the pic go to the right bank (all 3 cylinders), and the 2 bottom ones to the left (cylinders 2 and 4). 3 holes were tapped into the PVC canister and JB Weld was added to the threads before screwing in the hose barb to NIP adapters (3/16 X 1/8). 2 barbs point towards the front for the intake ports, and one points a bit downwards and towards the rear of the bike. 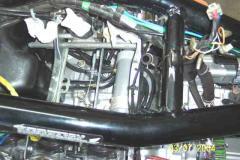 This tube continues under the battery box and then up towards the tool portion of the battery box. 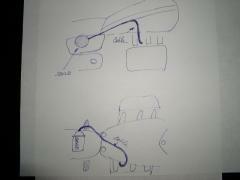 This is a simplified diagram of the complete vacuum setup for the cruise control on my Valkyrie Tourer. 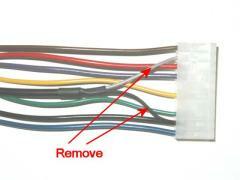 Remove and discard the black/gray pair wires. 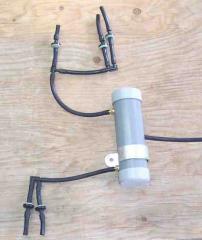 Remove the metallic strap attached to the servo. 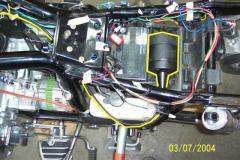 Remove small cover to setup the servo. 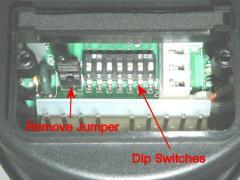 You now have access to the DIP switches, jumper, LED, etc. 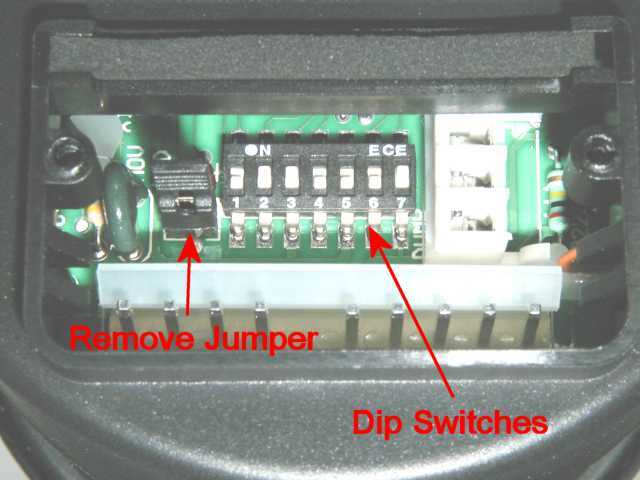 Remove the jumper (under the LED, next to the DIP switches) to specify that the cruise control unit is being installed in a manual transmission vehicle. Modified wiring connector plugged into the rear of the servo. The servo has been placed in the bottom of the tool box (behind the battery). To do so, I have cut the divider between the manual and tool locations with snips. To make more room I have also removed part of the plastic wall that is against the rear of the battery. A small notch was cut on the clutch side of the tool box to permit the servo cable to come out over the coolant reservoir. The battery cover was also trimmed to allow it to sit down further. Servo shown in bottom of tool box with vacuum inlet pointing downwards, and throttle cable pointed towards the clutch side of the bike. 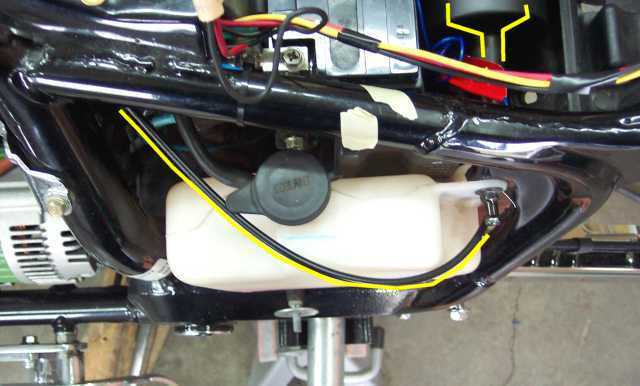 The cable goes around the top of the coolant bottle before reentering the frame behind the middle cover (with seat keyhole). 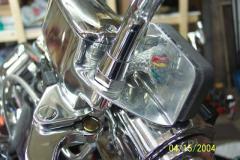 The cable passes over the centre cover and advances towards the right side of the bike (between the airbox and the frame). The cable comes down between cylinders 3 & 5 and then points towards the left side of the bike (parallel to the throttle bar). 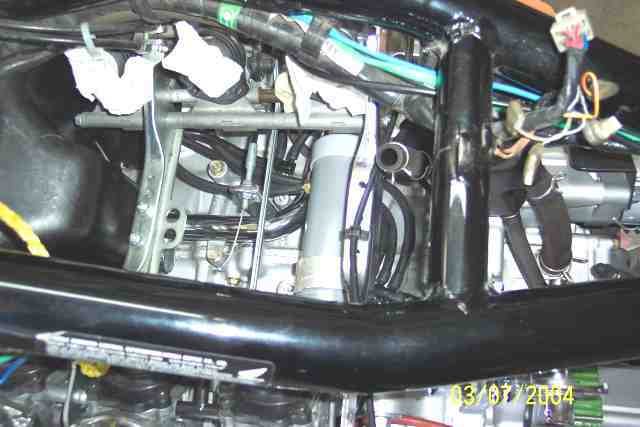 Attached on side of intake #5. 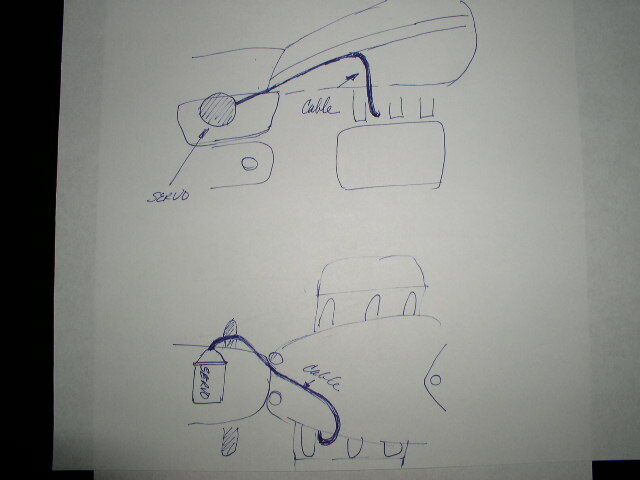 Joseph Byrd sent me the shown diagrams (top and side views). Two of these looped wire cables were found in the Audiovox parts list. I have used the shorter one. 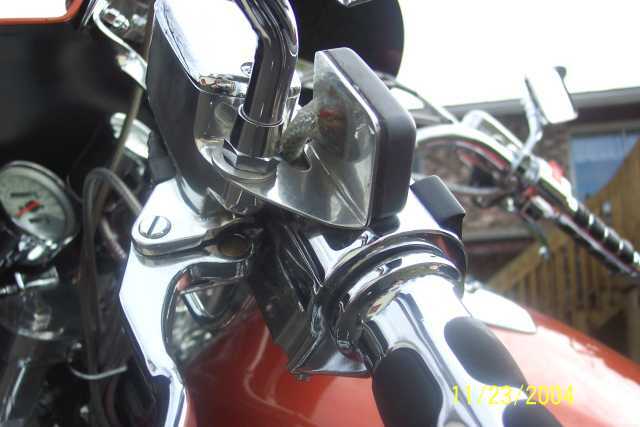 On our Valkyries, the carb throttle linkages of the left and right banks are connected by a flat bar. 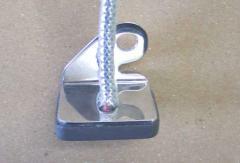 The end of that flat bar contains washers and a cotter pin. 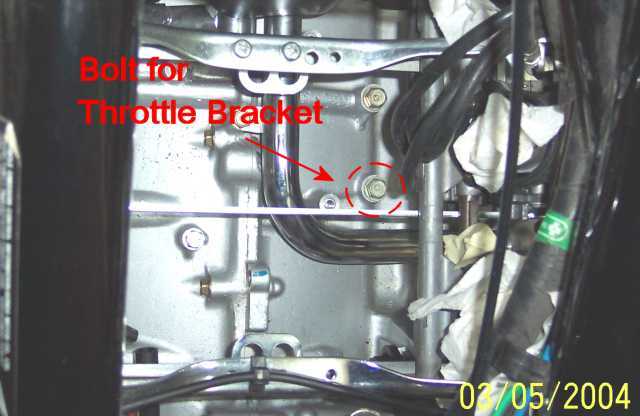 The Audiovox wire loop was attached to the left end (clutch side) of the flat linkage bar by removing the cotter pin and then placing the looped wire behind the flat washer. Watch it!!! 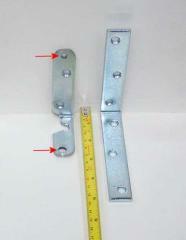 Small bearings, which are hidden behind the washers at the end of the flat bar linkage, can be easily dropped, lost, etc. 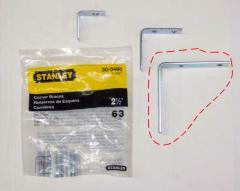 One end of the bead chain found in the parts list was attached to the end of the wire loop. 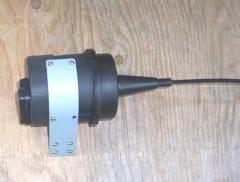 The other end will be attached to the Audiovox throttle cable. 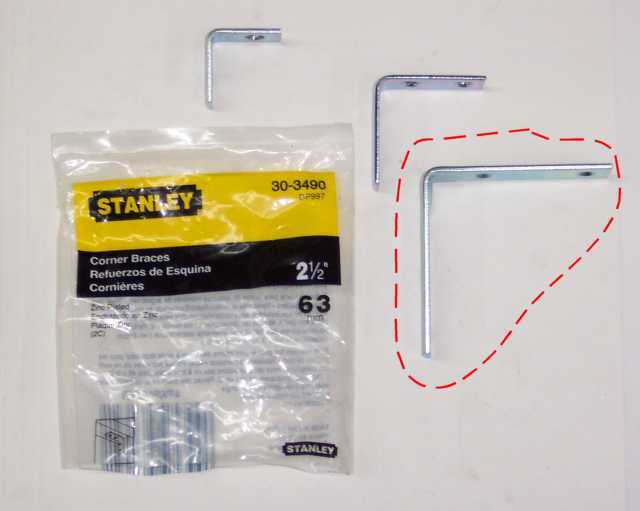 A corner brace from the hardware store has been used to fabricate a servo throttle bracket to be bolted on top of the engine (i.e. 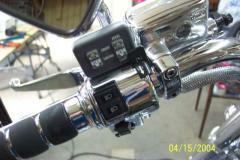 : to hold the servo cable housing end). 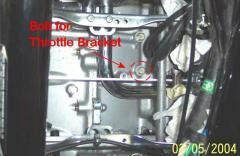 The throttle bracket on the left was fabricated from a corner brace as shown on the right hand side. A hole in the bottom was drilled to fasten it to the top of the engine. 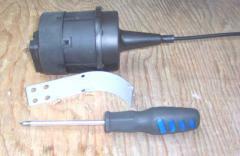 A hole was drilled in the top portion for the cruise throttle cable. 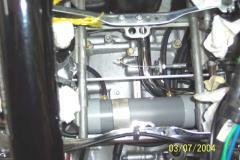 The shown bolt on top of the motor has been used to attach the servo throttle bracket. 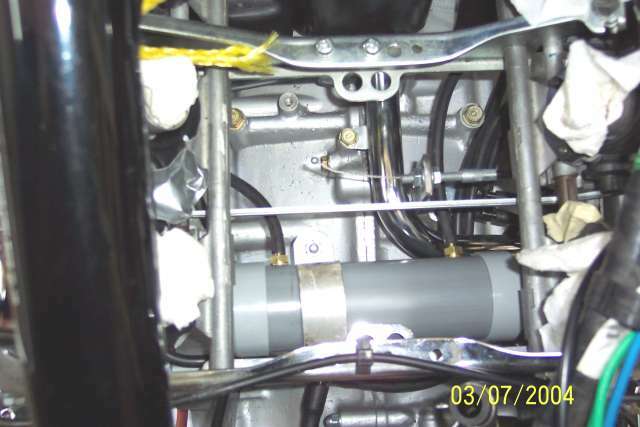 The servo throttle cable is placed parallel to the front of the flat carburetor linkage bar and the vacuum canister is behind it. Note that the vacuum canister has been painted flat black. The throttle cable was adjusted with just a bit of slack (approximately 1/8 inch) when it is pulled out of the servo all the way. 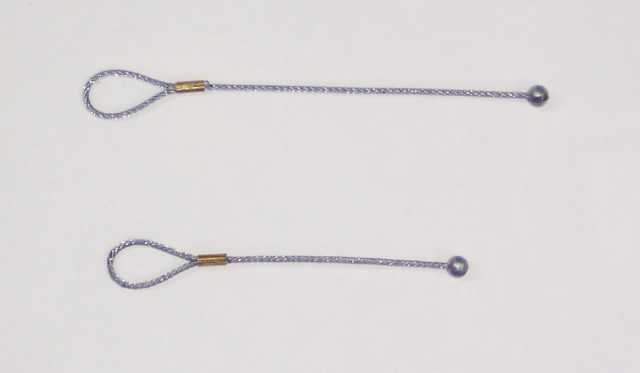 The beaded chain was then cut to the required length and attached to the end of the servo cable. Note: The beaded chain has been attached with a tie wrap to the side of the flat throttle linkage bar in order to prevent the chain from hanging up on anything. - Most of these wiring instructions have been copied from Dave Sproul's instructions. - Gray and black "pair" wires at the Servo (magnetic speed sensor): As mentioned above, remove and discard. 1. 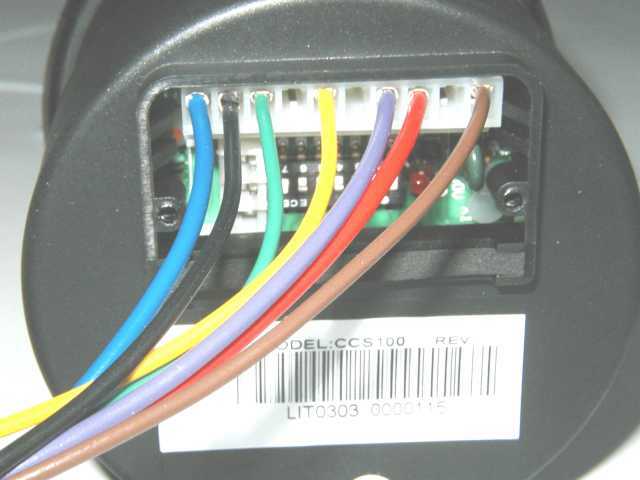 Brown, Yellow and Green wires: connect to the same colors at the Control Switch via connector plugs. 2. 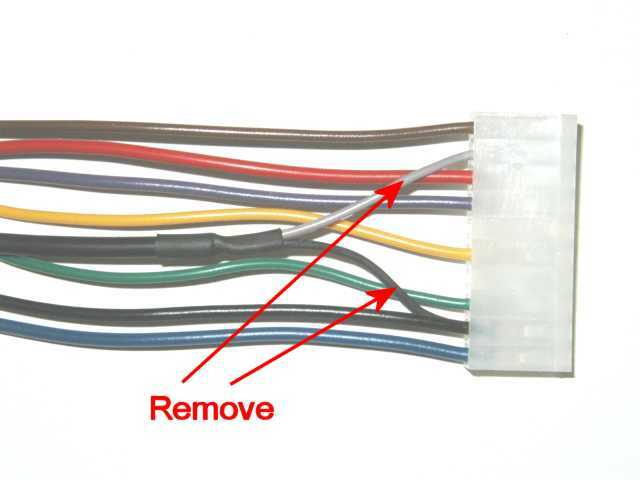 Red wire: Connect to 12 volt positive source (battery). Note: This lead will be hot even when the ignition is OFF. 3. 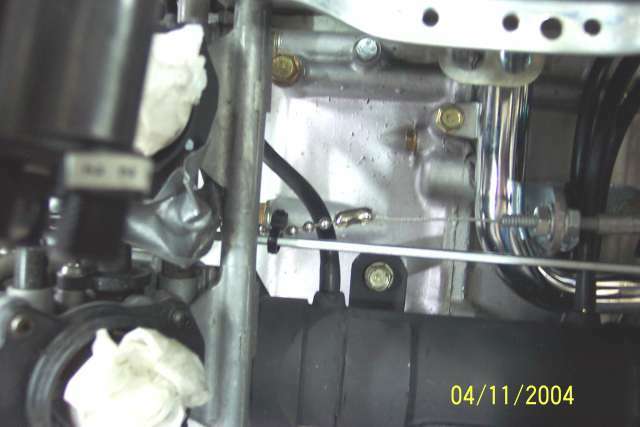 Blue wire: Connect to the NEGATIVE side of ONE ignition coil only. Note: Depending on which coil you choose, the wire will be either yellow/red, yellow/blue or yellow/white). 4. 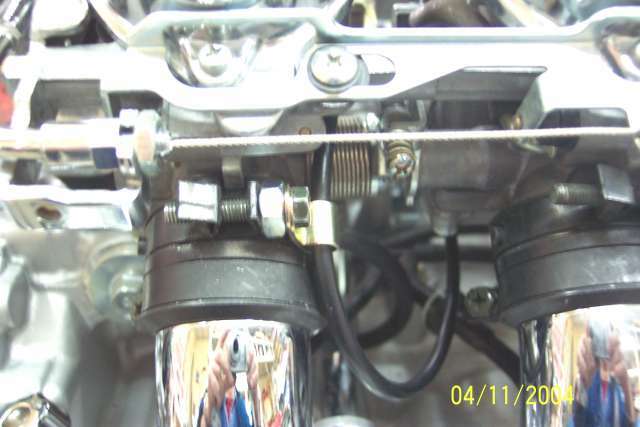 Purple wire: Connect to the brake light wire (make absolutely sure that this wire has power only when either the front or rear brake is actuated. On the Valkyrie, this wire is either GY (Green with yellow trace) or GR (Green with Red trace). Note: At http://home.comcast.net/~bp/cc/ it is mentioned: " - this wire will normally exhibit low voltage (8-9 volts) coming from the servo. This is a safety feature that allows the servo to sense that the brake lights are intact. If the servo cannot sense current flowing to ground through the brake light bulbs, it will not allow the speed control to be activated. 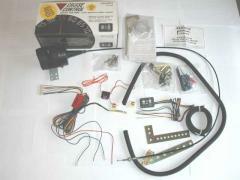 Certain brake light modulators may have an effect on the operation of the servo's brake light sensor." 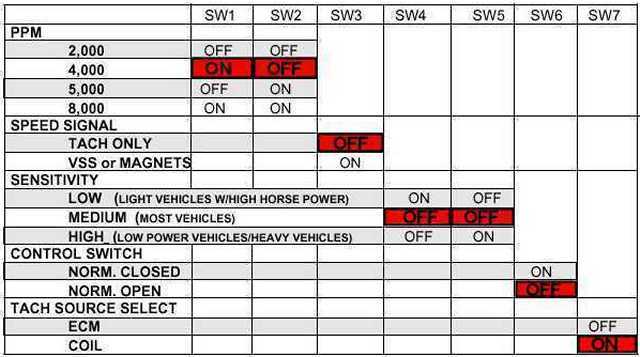 In other words, if LED's or brake light modulators are used, this will not work. In this case, refer to Brake Disable Feature below. 5. Black wire: connect to chassis ground. 1. 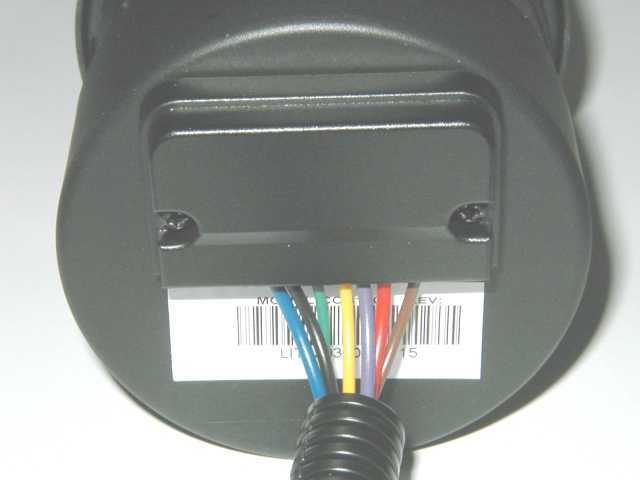 Brown, Yellow and Green wires: connect to the same colors at the Servo via connector plugs..
2. Red +Fuse + Orange wire: Connect to 12 volt positive switched source (ignition switch). This lead will be ON only when the ignition switch is ON. 3. Gray wire: Connect to 12 volt positive switched source (ignition switch). This lead will be ON only when the ignition switch is ON. Note: The above "3. Gray" and "2. Red + Fuse + Orange" wires could be connected to the same source. 4. 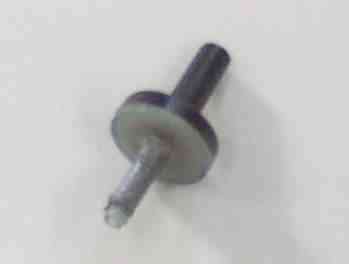 Black wire: Connect to chassis ground. In order for the CCS-100 Cruise Control to function, the Servo must be grounded through the purple wire (which is connected to the brake light circuit). When brakes are applied, the bulb lights and the ground is broken. The cruise is therefore canceled. 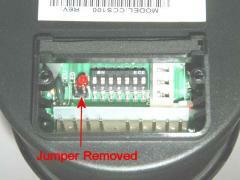 If LED's or certain brake modulators are used, the Servo will not function because it is not grounded properly. Resistors or relays can be used to get around this problem. 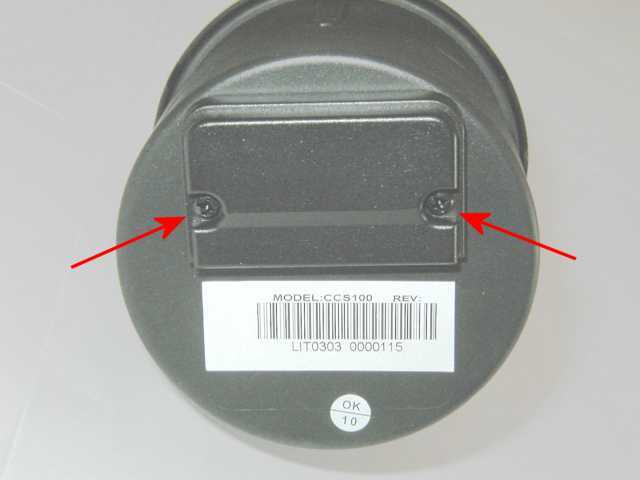 If regular OEM brake lights are used, instructions for resistors and relays can be ignored. 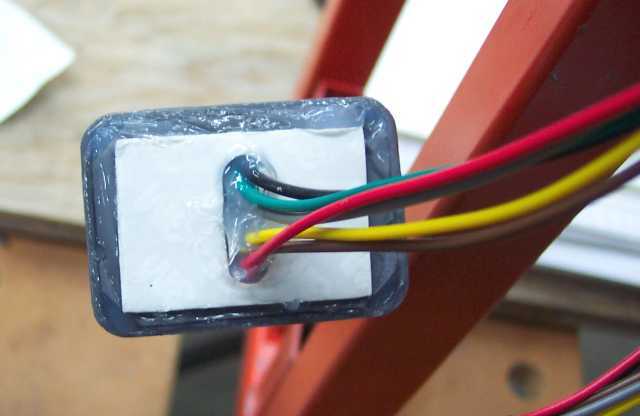 As explained at Debulking the Valkyrie on Rattlebars web site, to disable "bulb out" status, wire a pair of 10 Ohm wire wound resistors to ground. The Servo will then function. 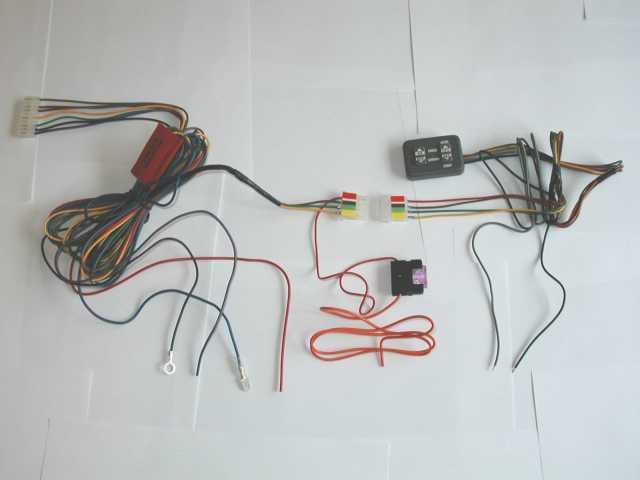 To permit the operation of the "brake disable feature", place a diode between the brake light circuit (pointing in the direction of the servo) and the purple wire. Click on the diagram to see this setup. Note: This set up, which I have used for a full riding season, functioned very well. However I have chosen to use a Normally Closed relay as shown below because I believe it is a cleaner way of doing this. - Purple wire from Servo to terminal 30. 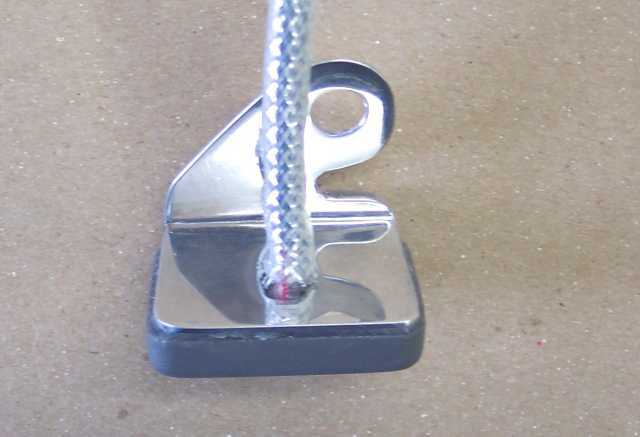 - Ground terminals 87a and 85. 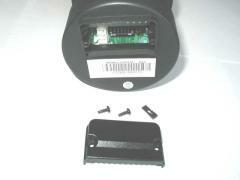 - Put a plug on terminal 87 (not used). - Brake pedal wire to terminal 86. This relay consists of a coil (terminals 85 & 86), a common terminal (30), a normally closed terminal (87a), and a normally open terminal (87). At rest, there is continuity between terminals 30 and 87a. This grounds the Servo. When the coil is energized, continuity between terminals 30 and 87a will be broken. Since the Servo is not grounded anymore, the cruise control is then canceled. Click on the diagram to see these connections. 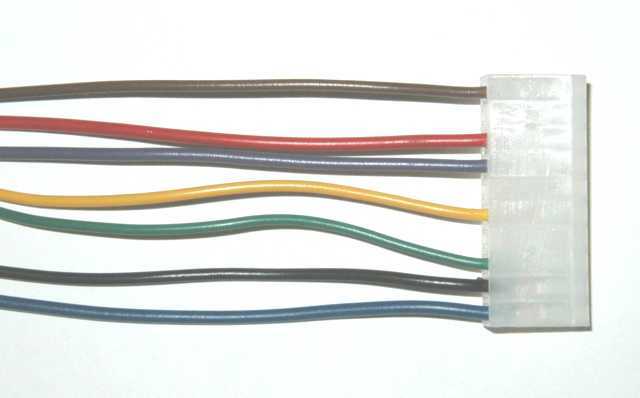 This relay consists of a coil (terminals 85 & 86), a common terminal (30) and a normally open terminal (87). At rest, there is continuity between terminals 30 and 87. This grounds the Servo. When the coil is energized, continuity between terminals 30 and 87 will be broken. Since the Servo is not grounded anymore, the cruise control is then canceled. Note: A tech. at Audiovox suggested to use a 30 amp relay. Since I already had a 20 amp "normally closed" relay, I have decided to try it. It has functioned for many months without a problem. 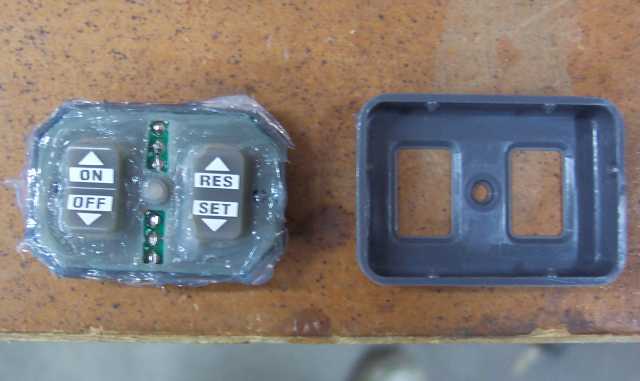 The front cover on the control switch was removed before using clear silicon RTV to seal the front portion of the switch. After reinstalling the front switch cover, the rear portion was also sealed with clear silicon. 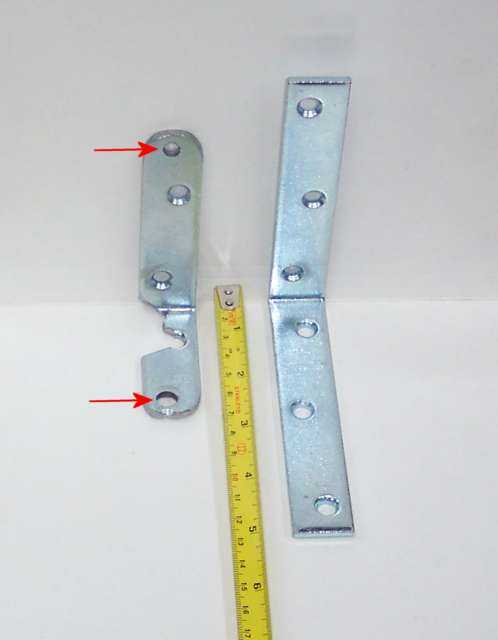 A bent piece of aluminum was used to fabricate the control switch mounting bracket. 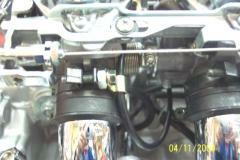 The bracket has been mounted between the master cylinder and the mirror stem.